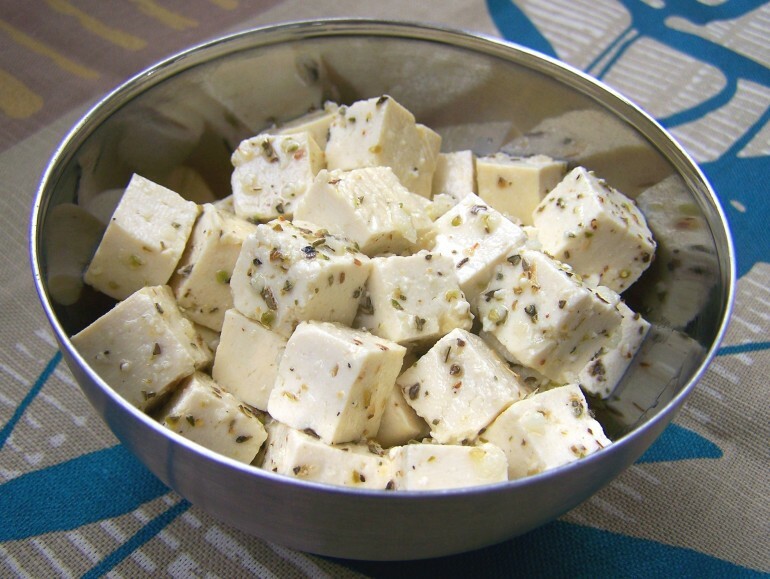 Good old tofu feta! It's a bit seventies, but I think it's still a really good and easy to make cheese substitute, especially if you use a nice fresh tofu, don't skimp on the flavorings and give it time to marinade. I think it's especially good for low carb vegans as it hardly contains any carbohydrate and lots of protein. Thanks to the tofu, it's also a good source of calcium. Of course it doesn't taste exactly like dairy feta, but if you just want some nice creamy cubes with a tasty oil marinade on your salad, this fits the bill perfectly. You might even be able to feed it to the tofu-fobic without them knowing what the mystery cheese is. You can use this 'feta' in cold and hot dishes like salads and pasta. You can use it as cubes, or crumble it up. If you're like David and me, you might find yourself standing in front of the fridge with the door open snacking cubes straight out of the container. If you're the fancy type, put some into a bowl and eat it with a cocktail stick. Cut the tofu into 1 cm (1/2 inch) slices. Place the slices between two layers of clean kitchen towels and firmly but gently press down on the towels to remove excess moisture. Cut the tofu slices into square cubes. In a bowl or other container, mix the ingredients for the marinade (oil to pepper). Add the tofu cubes to the container and mix well. Cover the bowl with a lid or plastic wrap, put it in the fridge and let the tofu marinade for at least half and hour but preferably overnight or longer. The 'tofeta' is now ready to eat. It will keep for three or four days in the fridge. This whole recipe has about 730 kcal, 62 g fat (9 g saturated), 3 g net carbohydrate, 6 g fiber and 44 g protein.